Ümit V. Çatalyürek is a professor in the School of Computational Science and Engineering (CSE) in the Georgia Tech College of Computing. Çatalyürek received his Ph.D. in 2000 from Bilkent University, Turkey. Çatalyürek is a NSF CAREER award recipient and the primary investigator of several awards from the U.S. Department of Energy, the National Institute of Health, and the National Science Foundation (NSF). 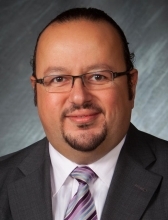 In addition to his teaching and research, Çatalyürek currently serves as Editor-in-Chief for Parallel Computing and as an editorial board member for IEEE Transactions on Parallel and Distributed Computing and the Journal of Parallel and Distributed Computing. In the past, he also served on the editorial board of the SIAM Journal of Scientific Computing and Network Modeling and Analysis in Health Informatics and Bioinformatics. Çatalyürek was the founding general chair of the inaugural ACM International Health Informatics Symposium in 2010, the program chair of the 2014 ACM Conference on Bioinformatics, Computational Biology and Health Informatics (ACM-BCB), the IEEE International Parallel & Distributed Processing Symposium (IPDPS) workshop chair from 2010 to 2015, the algorithms track chair for SuperComputing 2015 and IPDPS 2016, and general chair of ACM-BCB 2016. Çatalyürek serves on the program and organizing committees of numerous international conferences. He is an IEEE Fellow, a member of ACM and SIAM, the 2016-2017 chair for IEEE TCPP, and vice-chair of ACM Special Interest Group on Bioinformatics, Computational Biology, and Biomedical Informatics (SIGBio) for the 2015-2018 term. Çatalyürek has co-authored more than 200 peer-reviewed articles, invited book chapters, and papers. His main research areas are in parallel computing, combinatorial scientific computing, and biomedical informatics.